SI Hutchinson was chartered April 27, 1947 and meets regularly throughout the year. 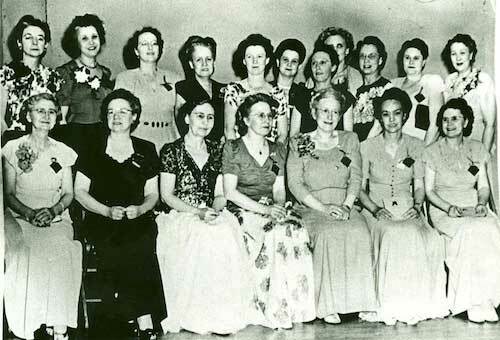 In this photo, our charter members are posing for a club photo at the first Soroptimist International of Hutchinson banquet held on April 27, 1947. They certainly dressed up for the occasion! Times have changed, but our mission is the same: to improve the lives of women and girls in the Hutchinson, Kansas area. Soroptimist International of Hutchinson participates in programs on the local level, depending on the specific needs of our community. Major club projects include the annual Hutchinson Women's Show and the Free Family Health Fair which are held simultaneously in adjoining buildings at the Kansas State Fairgrounds. Proceeds from local projects have funded cash awards to Reno County women who want to further their education and teenage girls who volunteer in our community. Sharing is Caring! Please share this page with others.